There’s a very pretty little girl - a tiny, delicate little girl - in Port Angeles, Washington, sporting a truly macho name: 12th Mann. Her parents, Troy and Kelly Mann, are staunch fans of the Seattle Seahawks football team and Daddy Troy claims his daughter sent a message from the womb that inspired the unique baby name. On January 19, the Mann family was snuggled up at home in front of the TV watching the game between the Seahawks and the San Francisco 49ers. The winner of the game would advance to the 2014 Super Bowl and it wasn’t looking so good for Seattle. That’s when their soon-to-arrive daughter started kicking. Troy says, “She’s never kicked for that long, she’s never kicked that hard, and I told my wife, ‘See, it’s a sign.’” Shortly thereafter, the Seahawks came from behind to win the game and secure their place in Super Bowl history. The Mann’s littlest sports fan arrived on Monday, January 27, and was officially christened Cydnee Leigh 12th Mann. Fans of the Seahawks have earned the distinction of being the loudest fans in the National Football League (NFL) and the team thinks this vocal enthusiasm gives them the advantage for home games. The team’s avid fan base is known collectively as “The 12th Man,” which is exactly what it sounds like when little Cydnee Leigh’s middle and last names are spoken together: 12th Mann. The baby was dressed in 12th Man fashion from the beginning. Newborn photos show her in head-to-toe Seahawks team regalia even while she’s still wearing her hospital ID anklet. Mama Kelly showed off her newest football fan while wearing a Seahawks team T-shirt of her own and refers to the baby as “our little Sea Gal.” The Seahawks cheerleaders are the Sea Gals. Little 12th Mann has older siblings at home - aged 6 and 10 - who are ready now to change their middle names to “12th,” too. One set of grandparents might not be so enthused. According to Daddy Troy, a grandfather who lives in Colorado is an avid fan of the Denver Broncos. On Super Bowl Sunday, the Seattle Seahawks won a solid victory over the Denver Broncos with a score of 43:8. Any doubt how the Mann family spent their day? Source: Jernigan, Joy, and A. Pawlowski. 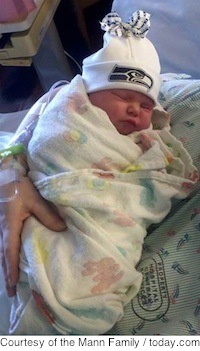 “Seattle Seahawks fans name baby ‘12th Mann.’” TODAY Moms. TODAY / NBC. Jan 30, 2014. Web. Feb 4, 2014.